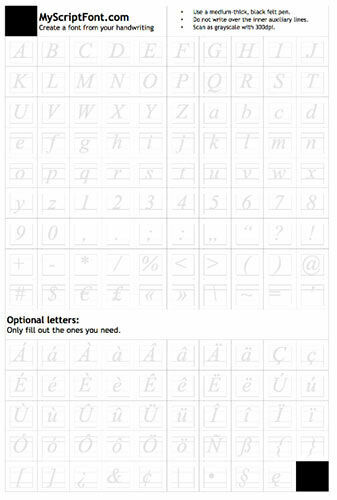 Create a Font from your own Handwriting using this FREE online font generator to create your own OpenType (OTF) or TrueType (TTF) fonts within a couple of minutes to use in programs on Windows, Mac OS X and Linux. You can use this to personalize your digital scrapbook pages and invitations, create your own digital signature, type letters that look like your handwriting, etc. 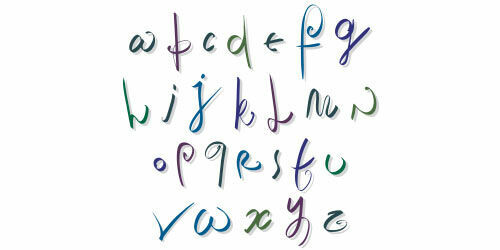 Your new font can be used in any of your software, such as Microsoft Word, Photoshop, PowerPoint, and many others. Visit Myscriptfont.com or download the template as either a PDF or PNG. Print the template and use a medium point pen or fine point felt marker or open it in a paint program to fill it out. * I used a fine point felt tip marker in black. Scan the document you just filled out in 300 dpi, in black and white, and scan must be in portrait format. Upload the scanned document you just did to Myscriptfont.com and name the font, select which format you would like OpenType or TrueType, click Start and save to your computer. Install the new font on your computer(s) by double clicking on the saved file. Enjoy using your new font! Tell your friends that they can create a font from your own handwriting.